New Society Publishers, 9780865717435, 313pp. Conventional wisdom has North America entering a new era of energy abundance thanks to shale gas. But has industry been honest? Cold, Hungry and in the Dark argues that declining productivity combined with increasing demand will trigger a crisis that will cause prices to skyrocket, damage the economy, and have a profound impact on the lives of nearly every North American. The mainstream media has told us that natural gas will be cheap and plentiful for decades, when nothing could be further from the truth. Forewarned is forearmed. 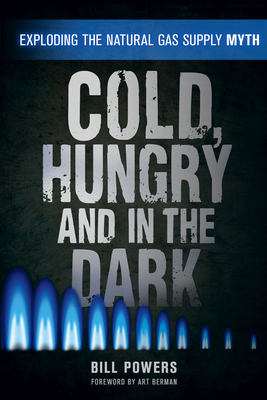 Cold, Hungry and in the Dark is vital reading for anyone concerned about the inevitable economic impact of our uncertain energy future. Bill Powers is the editor of Powers Energy Investor and sits on the board of directors of Calgary-based Arsenal Energy. He has devoted the last fifteen years to studying and analyzing the energy sector. Bill Powers iis the editor of Powers Energy Investor and previously the editor of the Canadian Energy Viewpoint and US Energy Investor. He has been publishing investment research on the oil and gas industry since 2002 and sits on the Board of Directors of Calgary-based Arsenal Energy. An active investor for over 25 years, Powers has devoted the last 15 years to studying and analyzing the energy sector, driven by his desire to uncover unrecognized trends in the industry and identify outstanding opportunities for retail and institutional investors. Art Berman is a geological consultant with thirty-three years of experience in petroleum exploration and production. He is a Director of ASPO-USA (Association for the Study of Peak Oil & Gas USA) and sits on the editorial board and is a frequent contributor at The Oil Drum. Art has published over 100 articles on geology, technology, and the petroleum industry.